Had to wrestle to the lid from the core hehehe. 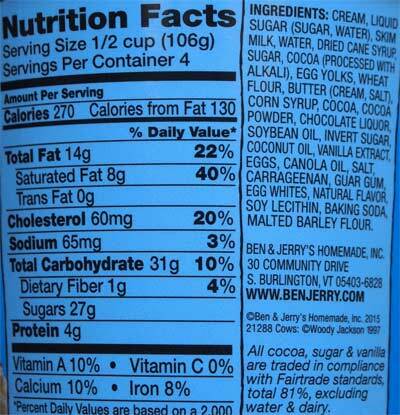 The brownie chunks seem plentiful in my pint. Their chocolate with chocolate brownies is that familiar flavor you know and love. As much as I love giant brownies, I'm glad they downsides them for this flavor so that they are more spread out. It's a nice rich vanilla flavor on the other side. We're all so use to mix-ins with B&J's that I tend to forget that they make a real nice vanilla base. Ok, let's mix in the core with the vanilla side. Funny, you don't really taste the core until the end. I try the same trick on the other side. Interesting. The core stands out and definitely adds more to the chocolate side. We are and aren't breaking new ground here. In one sense, we've got the nice vanilla base you know. We've got the chocolate base and brownies you know. The core adds a bit of uniqueness to it all without going crazy. In a way it is simplistic, but I truly mean that as a compliment, not an insult. Ok, one last scoop with brownie and off it goes back in the freezer. So I'm done and I am satisfied with my treat. 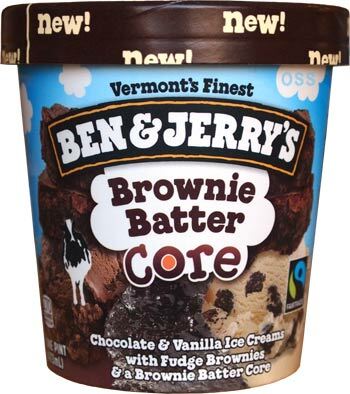 Knowing the very high standards we hold Ben & Jerry's too, I suspect some of you will be sad that the core doesn't have more of a batter kick, and that's fine, I get that. However, it's still a really nice treat with quality ingredients and just a really nice balance to all of the components. I'm definitely ok with the fact that I bought two pints. On Second Scoop: So yesterday my wife had the top third of the pint, I dug in to the middle, and then I saved the rest for today... but I had a little revelation when I opened the pint. Where did the core go?? Look at the pic, it's completely gone! 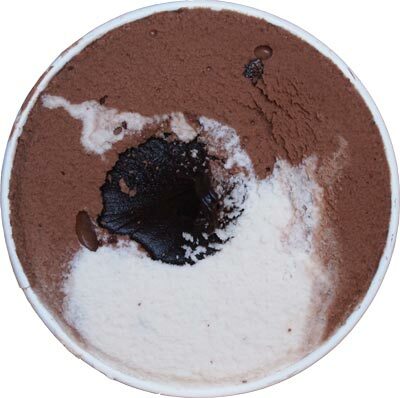 (Keep in mind that the center there is over a third of the way up the pint). There seemed to be a few tiny drips of core as I dug around for it, but that's it and it was a pretty big let down. I do have another pint and I will update once I've dug in to that one, but for now, be wary it might happen to you as well. That looks so good. I adore the brownie ice cream and their vanilla so this seems like the perfect combo, I didn't see it at stop and shop yet but I'll check market basket and wegmans but I am pretty frugal so I'm waiting for a sale. I haven't heard anything about new core flavors! @Caitlin: I thought i had the C&C cheesecake in my hand! @Rachel: We suspect at least hazed & confused and that's my jam have been cancelled to make room for these but we're aren't positive yet, stay tuned! May I request you try the dairy free and vegan flavors? I'm drooling! I love all the core flavors I've tried so far. They're like portable sundaes. @Maja: B&J's is suppose to send them over sometime soon! Oh man, scratch that, you also need to try their new Coconuts for Caramel Core Ice Cream too!!!! How many core flavors did they release and why am I not seeing them on their website??? @Caitlin: their stuff often (but not always) pops up shortly before the official announcement. I found them about a week early last year so I suspect the website will update soon. The core very much reminded me of gooey brownie batter, both in taste and texture (Dubba's taste buds are obviously more refined, but I really enjoyed what core was there). 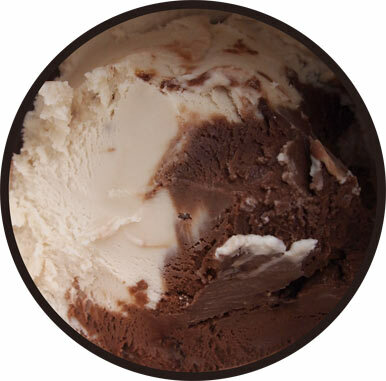 The chocolate and vanilla ice creams are standard Ben & Jerry's bases, and the brownie pieces are OK, but the star is the core. Even as a non-chocoholic, this is a darn good flavor and easily my second favorite core flavor behind Spectacular Speculoos. Interested to see what you think of the Dairy Free; I've tried the Fudge Brownie and might try the PB Cookies despite not having much luck with the old What a Cluster. Finally tried this last night. So good! I let it defrost for about fifteen minutes (willpower!) and it was worth it. The consistency was perfect. I loved the core do much. It definitely was more like fudge sauce but mixed with the ice cream, it was perfect and reminded me of my old favorite flavor with the fudge truffle core. It seemed a little light on the vanilla side but what I had was excellent. And because the fudge brownie is my favorite, the addition of the core was spectacular. 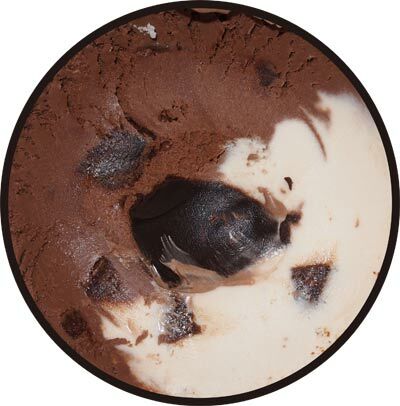 I should eat it out of the pint though since scooping it mixed the favors together too much, enabling the chocolate to overpower the vanilla. Next time! But so so pleased. And at $2.15 for the pint, what a deal! . So I had this again and I think I will pull a "Dubba" and say it is a weird flavor. 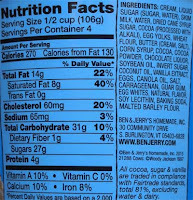 Dont get me wrong...it is delicious but I feel as though it tastes lower quality than other Ben and Jerry's. Maybe it was because it was hot out and it got very soft but the core seemed thinner and more like regular Hershey's syrup and when the chocolate melted into the vanilla, it blended together too much, preventing me from tasting enough of the great vanilla flavor. It also didn't seem quite as creamy. So, although still super yummy, it seemed like a less premium but still decent ice cream with Hershey's syrup would have had a similar effect.